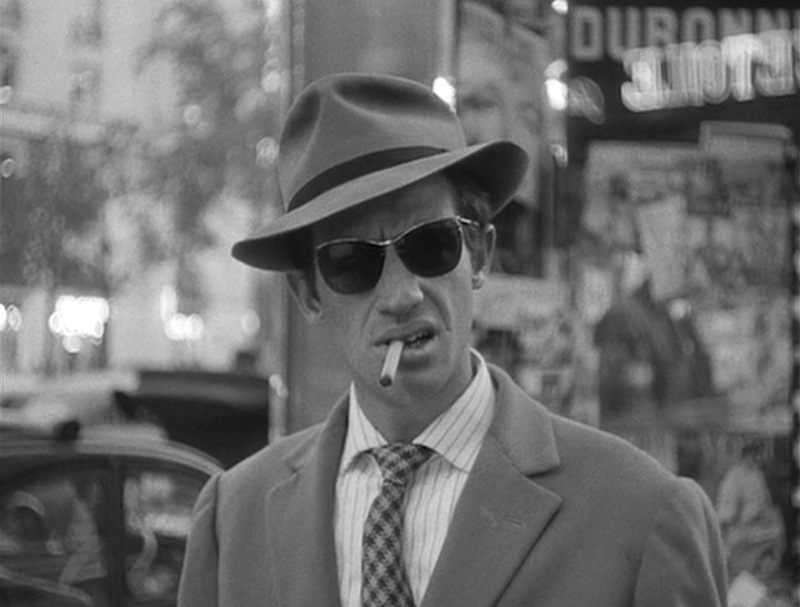 In that 1961 piece, Schneider was profiling Belmondo for a piece called “A Punk With Charm,” referring to the actor’s role in Breathless as the Bogart-idolizing Michel Poiccard, a swaggering and sociopathic walking id. 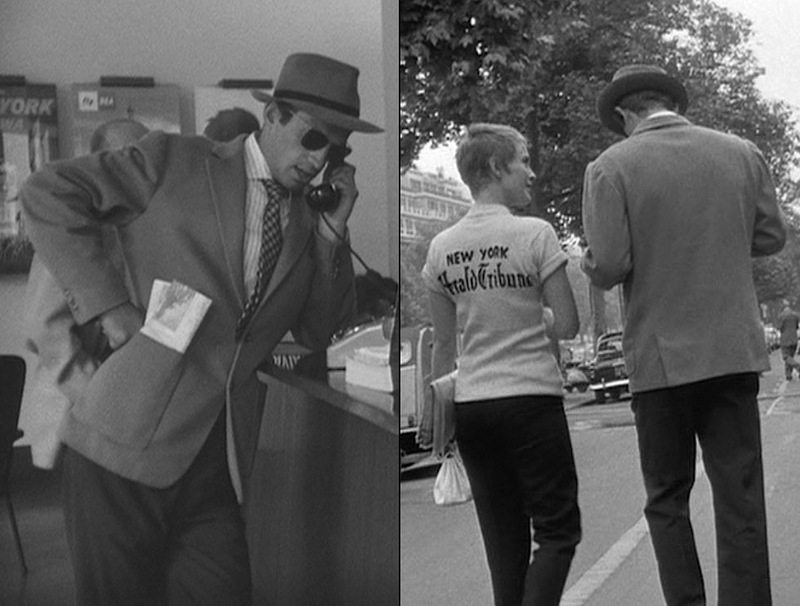 More than five decades later, Breathless remains a crucial touchstone of modern cinema with Belmondo’s performance praised alongside that of Jean Seberg as his stylish American girlfriend, an ingénue in appearance if not practice. Despite its lasting impact, Breathless takes itself about as seriously as its lead character (dare I call him the protagonist? ), who floats from crime to crime and lover to lover in a series of jump cuts punctuated by Martial Solal’s jumpy jazz score. We don’t see a lot of male grace in films nowadays – built-up bulk and a punchier, more robust aesthetic have taken its place. Go back to the 1950s and, particularly in the art films, there’s a subtler, more detailed attention to the male form and its ability to express emotion. 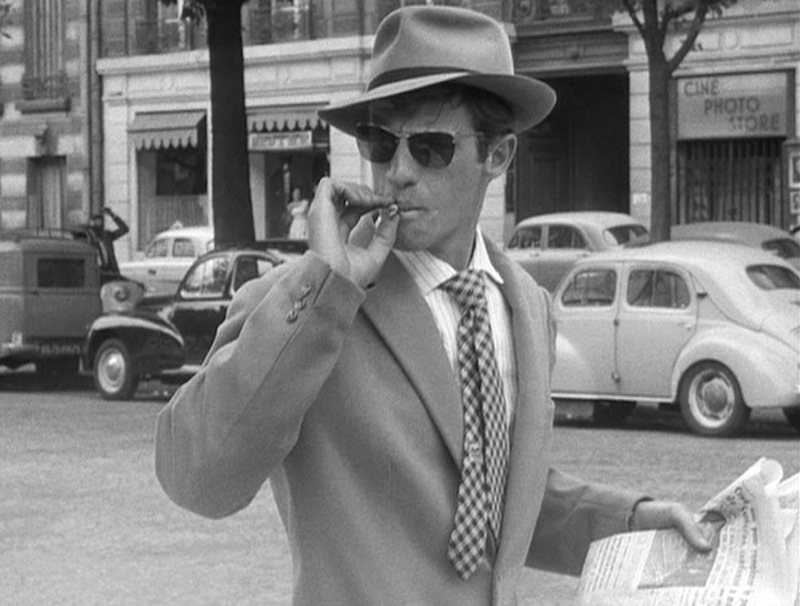 Belmondo may not be as polished as a Cary Grant, nor as sensuously sculpted as a Marlon Brando. His character in Breathless is perfectly hateful – a petty thief who sees himself as a classy tough even as he’s robbing and insulting his girlfriends. But what’s fascinating is that the way he carries himself tells us something entirely different. We fall in love with this lowlife not because of his lines or his story but because of his moves. He bursts with an endearing, boyish energy, light-footed and carefree, fed by the restless motor of a dreamer. The jacked-up optimism in the way Belmondo moves tells us his character has heart, wit, and promise, even if his words convey the opposite. 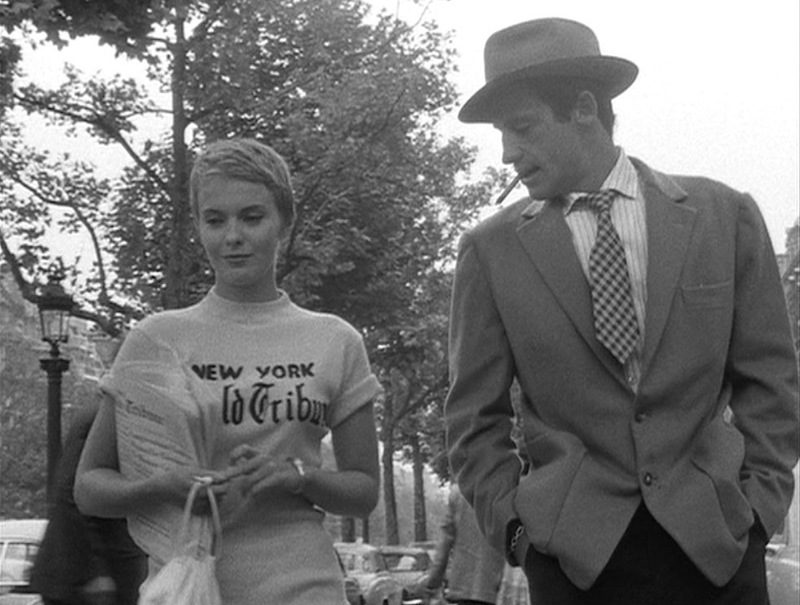 Belmondo plays Michel, who heads to Paris from Marseille in a stolen car to a) retrieve money he is owed and b) lure his sometime girlfriend Patricia (Seberg) into running away with him to Rome. A romantic with a psychopathic streak, he ends up killing a policeman in a highway stop. 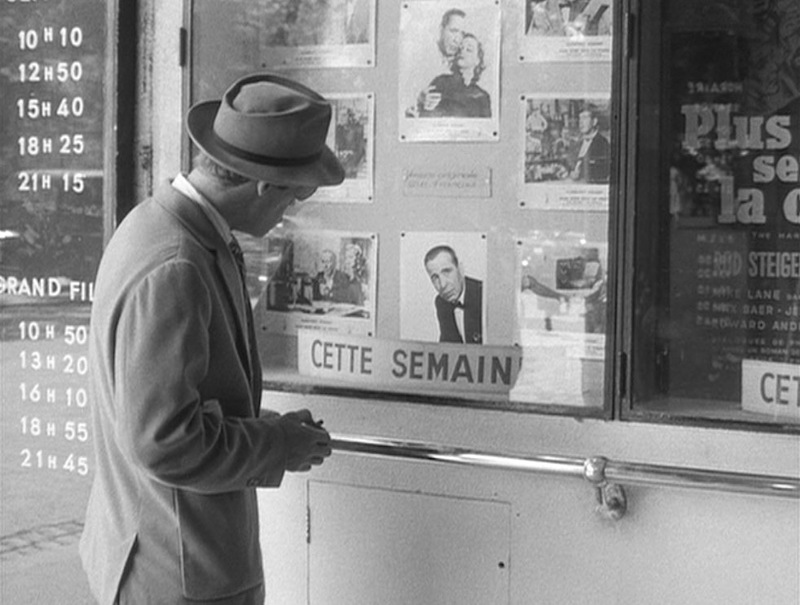 Fugitive status only energizes him; once he reaches Paris, Michel is in open pursuit of Patricia, the guy who owes him the cash, and his own notion of noirish glamour. 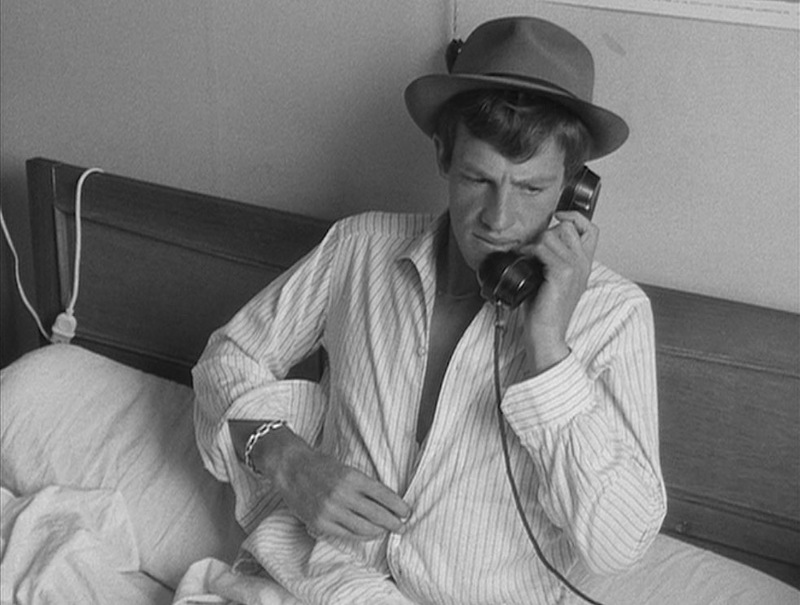 Jean-Paul Belmondo has been well-explored as a style icon in his own right with his own carefree sense of style, a degree of sprezzatura less studied in its genuine nonchalance than the term itself implies. 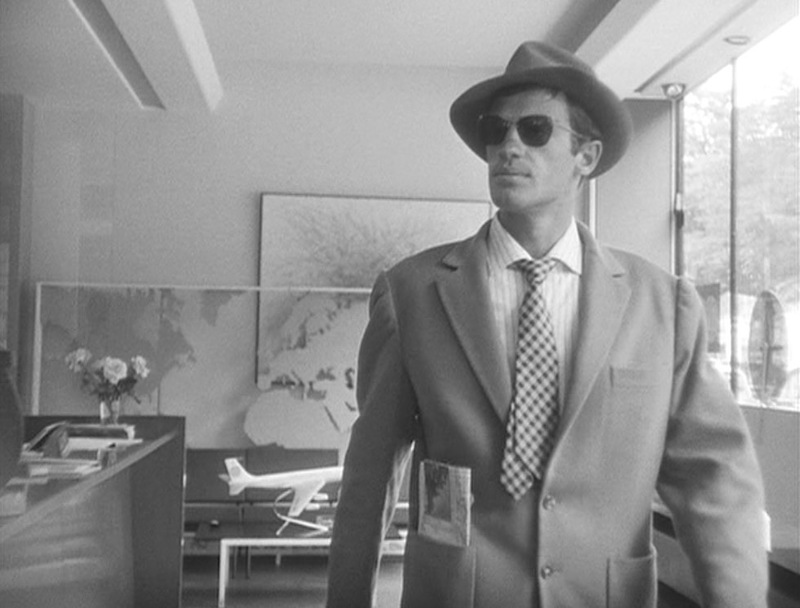 In Breathless, Belmondo’s Michel takes this a step further, dressing “with the same carefree thoughtlessness as he lives: a cacophony of stripes and checks and stubby ties and a jacket that’s way too big for him,” as Richard James Savile Row wrote in its online tribute. Michel begins the film in a chaotically large-scaled herringbone tweed jacket, both too big for him and too warm for the Marseilles summer climate. He impulsively ditches that tweed jacket after an equally impulsive roadside murder, sprinting into Paris where he finds relative safety in a new set of duds: a striped shirt, checked tie, and soft oversized sportcoat. 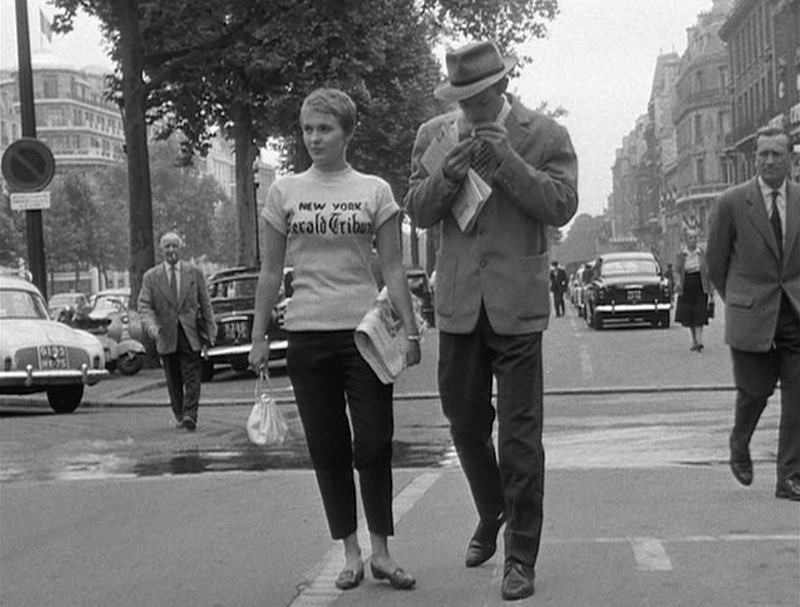 The youthful iconoclasm and energy exuded by Jean Seberg and Jean-Paul Belmondo strutting down the Champs-Élysées in Breathless became an iconic moment in the history of nouvelle vague. The gray-scale film and lack of available color photos from the production means I can only speculate about the color and some of the details of Michel’s clothing. Based on the texture, weight, and styling of his light-colored single-breasted jacket, I deduce that it is tan camelhair, an unseasonably warm choice consistent with the odd choices Michel makes when determining his wardrobe. Ever the rulebreaker, Michael typically wears both of the two front buttons fastened. Both the blade and the tail of his tie often flop out through the opening over the first button, a clear mismatch of a too-short tie with a low button stance. The jacket’s soft natural shoulders emphasize the oversized fit as the roped, shirred sleeveheads visibly fall below each shoulder. If a jacket doesn’t fit on your shoulders, no amount of tailoring can make it fit correctly at all. Despite its excessive fit through his chest and shoulders, Michel’s sport jacket is still considerably short for 1960. The jacket has short double vents, an indication of the increasingly seen trend of side vents of suit jackets and sport jackets through the middle of the 20th century. The breast pocket is welted but the hip pockets are sportier, casual patch pockets. There are three buttons on the cuff of each sleeve. “The long stride, the oversize jacket bobbing above it. He’s filmed to look big and broad-shouldered, but it’s the fluidity of his stride and the harmony in his whole body that telegraph abundant confidence. Head tipped back, posture regal, he’s a man brimming with self-assurance and vitality,” wrote Sarah Kaufman, accurately capturing Belmondo’s on-screen swagger in her 2010 Washington Post article. Think Michel limits his unconventional fashion to just his jacket? Au contraire! Michael’s shirt, white with bold dark pinstripe, has a sport collar that curves away at the neck and clearly not meant to be worn with a tie. This button-less collar has the effect of a natural wide spread that Michel banks on keeping together by the strength of his tie knot. The collar is similar to the “unique Italian collar design” that Anto Beverly Hills offers its bespoke customers seeking a sport shirt to be worn sans tie. Michel’s shirt has a plain front, breast pocket, and mitred barrel cuffs with two buttons to close. Labels are visible for both the shirt and tie, but I’m not well-versed enough in late ’50s French menswear branding to definitively identify either garment. Michel’s necktie is patterned in a wide-scaled check resembling houndstooth. The two-color tie is almost certainly black and white like this similar but less stylized tie available from Amazon. 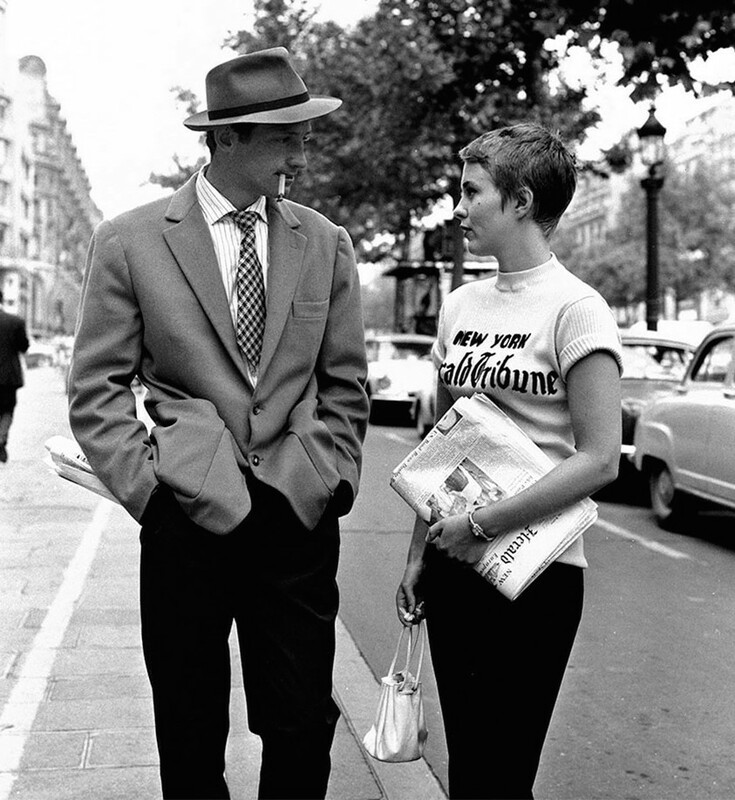 Belmondo oozes French nonchalance on the streets of Paris. Below the belt, Michel retains all the same clothing he had been wearing for the opening scene and the Marseilles murder. His dark wool trousers have double forward pleats with a small flapped coin pocket perfectly bridging both pleats on the right side. The trousers also have slanted side pockets and two back pockets which each close with a pointed flap. They are cut straight through the legs to the plain-hemmed bottoms. Like his jacket, the trousers are oversized – likely even more generously fitting due to the double pleats – unattractively bunching up over the fly when Michel fastens them tight around his waist with a simple dark leather belt. Michel gets ready in Patricia’s apartment. Michel’s shoes are probably the most conventional aspect of his attire. He wears dark leather three-eyelet derby shoes with a cap toe. 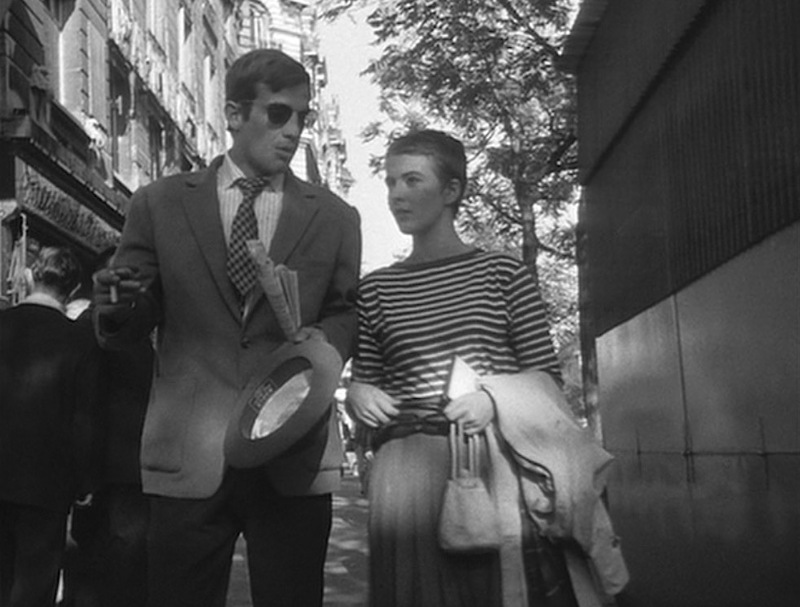 The two pallid-looking businessmen on either side of our protagonist couple are dressed similarly to Michel in light jackets, dark trousers, and ties, but Belmondo’s character is clearly not one of them. Nevertheless, the “uniform” shows his effort to blend in to the world of 1959 Paris… hampered by his own instincts to stand out with swagger. …although Michel wouldn’t be Michel if his footwear was totally conventional. His white socks boldly contrast with his shoes and trousers as he strides through the streets, unlike a more appropriate pair of trouser-matching dark socks. Michel also wears a pair of white cotton boxer shorts with a short two-button adjustor tab on the front of the elastic waistband. 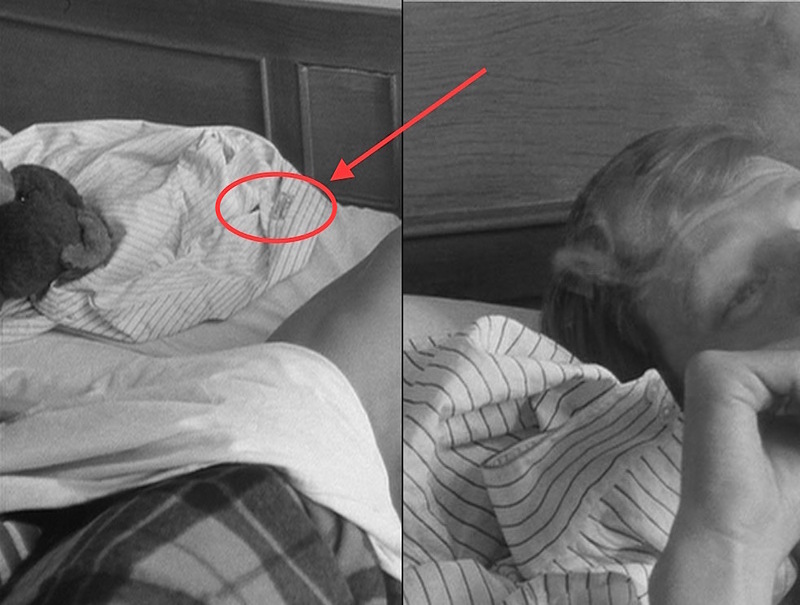 An undies-clad Michel smokes one of his own Gitanes cigarettes, eschewing Patricia’s Chesterfield King Size cigarettes on the bedside table. Michel wears two thin necklaces with a short dropped pendant on each. One of the pendants appears to be etched with a monogram. Michel’s necklaces may be Belmondo’s own jewelry. Does anyone know any more about these? On his right wrist, Michel wears a chain-link ID bracelet that is also etched. In fact, close-ups of the bracelet appear to include the initials “J.P…” which would undoubtedly stand for Jean-Paul, indicating yet another piece of jewelry that may be one of Belmondo’s own personal items. With each of his three outfits, Michel wears a different hat. 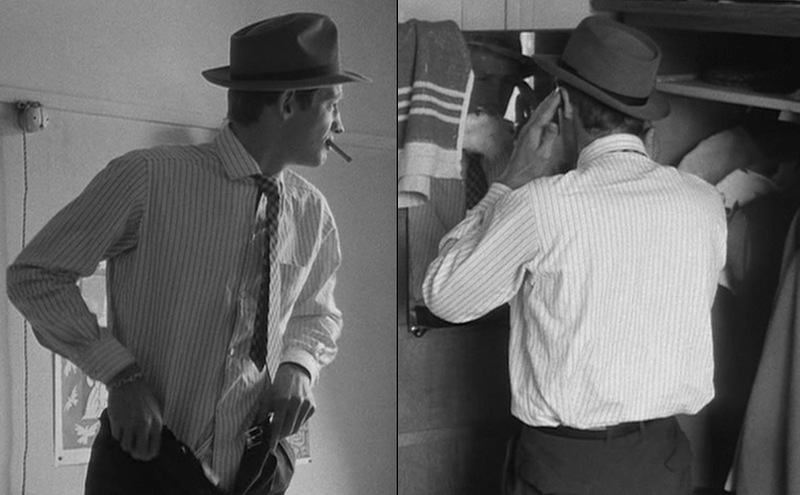 Idolizing Humphrey Bogart as he does, Michel naturally opts to wear a fedora with his first two outfits; the dark fedora from the opening scene is replaced by a lighter felt fedora with this outfit. Michel’s hat has a high pinched crown and a narrow black grosgrain band, certainly narrower than the typical bands of Bogie’s day. Michel at his European coolest, looking exactly the way he wants people to see him. After mugging a random man in a public restroom, Michel joins Patricia for a walk through the streets, holding his hat and revealing the inner leather hatband with a hatmaker’s insignia visible. More eagle-eyed or knowledgeable BAMFs out there may be able to ID Michel’s hat based on this angle. Any idea about Michel’s hat? 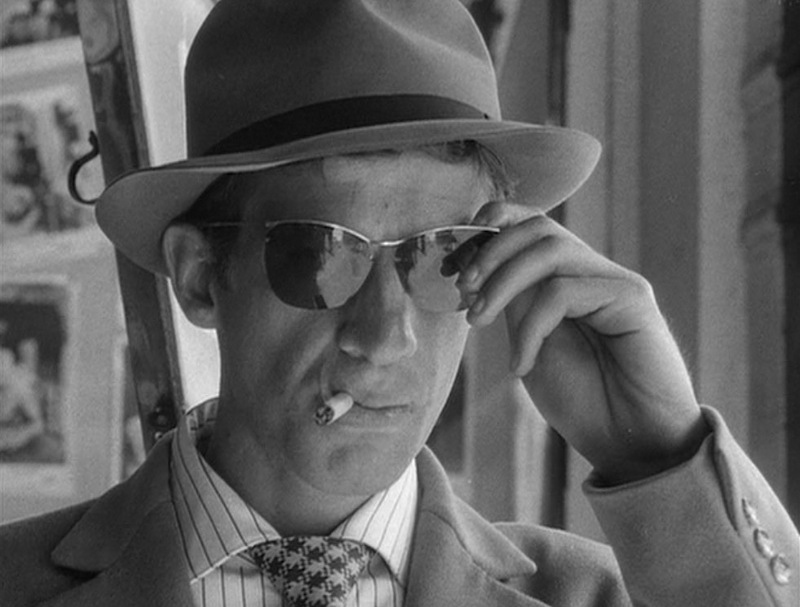 French New Wave hero that he is, Michel adds an extra layer of cool to his image by sporting a pair of semi-rimmed sunglasses with dark lenses and a metal “cat eye”-shaped browline frame, very evocative of the Jet Age but thus far unidentified. Michel is the type of guy who reverently takes off his sunglasses in honor of a photo of Humphrey Bogart but leaves them on when kissing his girlfriend. The shape recalls Dior’s classic 2150 frame, but Belmondo’s sunglasses also share some cosmetic similarities with the vintage gold half-rimmed Nylor sunglasses worn by Brad Pitt in Allied (link). And yet… here we are discussing it nearly sixty years later. What’s the secret? ..and once you get it, you can put your own spin on it. Michel Poiccard cares about his appearance but not enough to pay attention to his actual clothes. You can emulate his style without making his same mistakes. 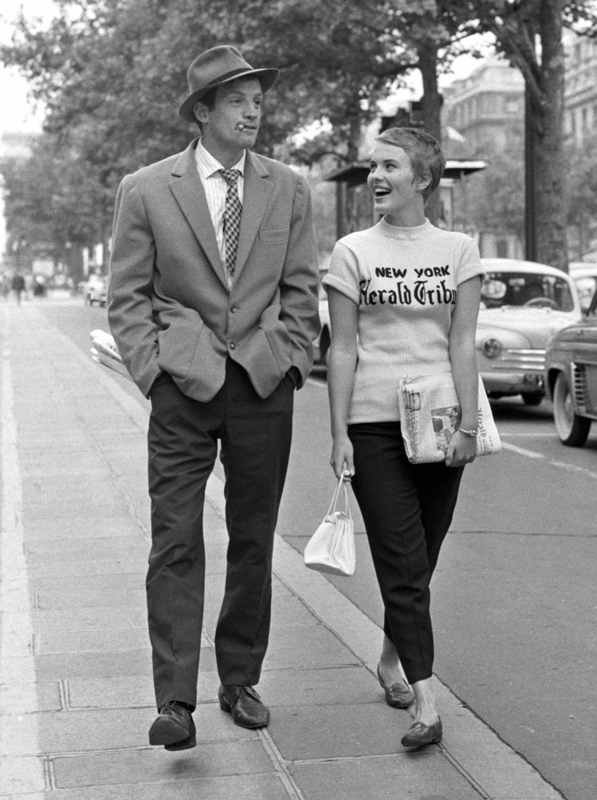 If it’s too hot for Belmondo’s heavy layered getup, you could also channel Jean Seberg’s New York Herald Tribune shirt with this custom t-shirt from Society6 that will wink at other Breathless fans and baffle anyone else who may be wondering why you’re championing a newspaper that shuttered more than a half-century ago. Grief’s stupid, I’d choose nothing. It’s no better, but grief’s a compromise. I want all or nothing. 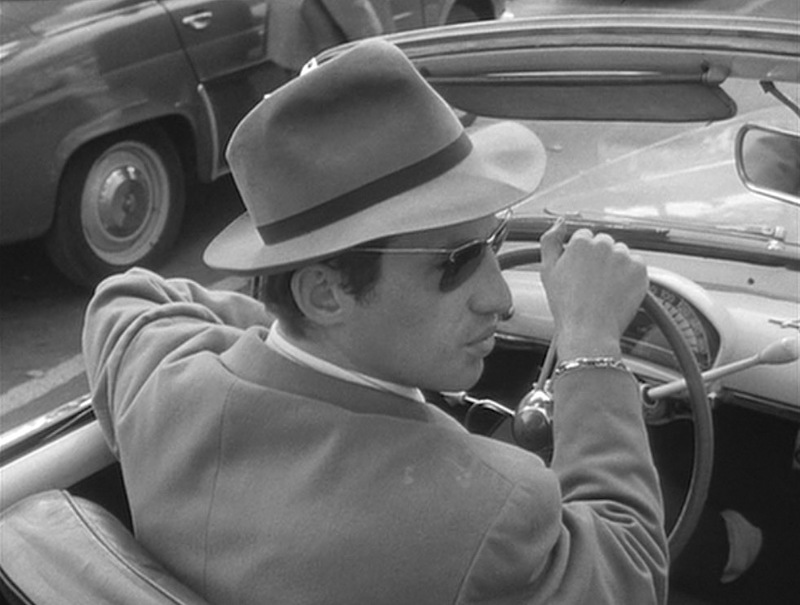 The sunglasses worn by Jean-Paul Belmondo is a Sol-Amor. The brand has recently been recreated in France. The brand was famous in france in the 50s. It was the official sunglasses for French airline pilots.